For the Japanese market only, where mercury lamps continue to be a very popular light source, Iwasaki manufactures a number of special types. 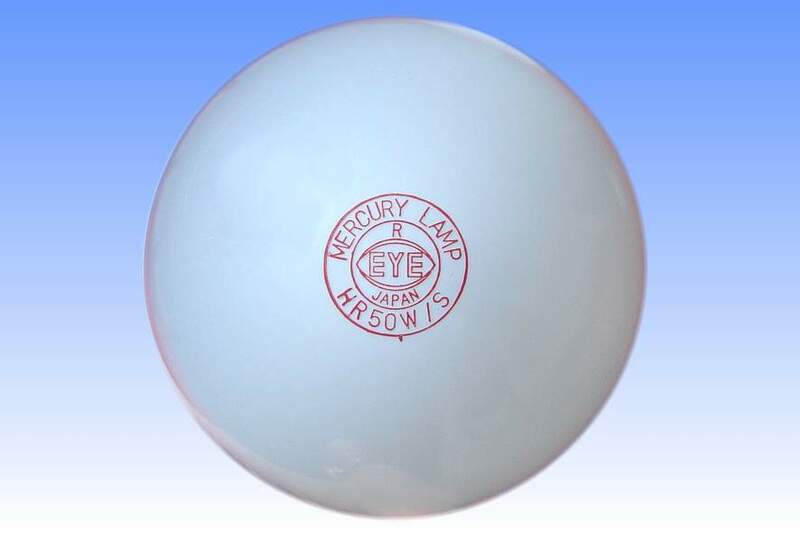 One of these is the selection of low wattage mercury reflector lamps in R64 and R95 versions (R20 and R30 sizes in eighths/inch). The lamp illustrated here employs a standard 50W mercury arc tube sealed into an R64/R20 reflector envelope. The outer bulb has been shaped into a deeper ellipsoidal format than usual, enabling it to optically work more efficiently with the elongated source of the mercury discharge tube. 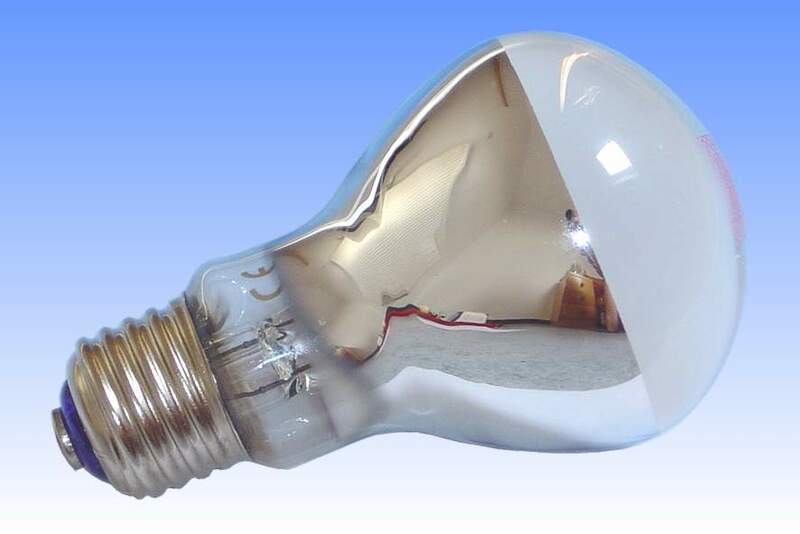 An aluminised coating inside the bulb provides the light reflective surface. Over the top of this and the front window of the reflector is a layer of finely divided alumina powder, which acts as a light diffusing coating to improve the beam uniformity slightly. 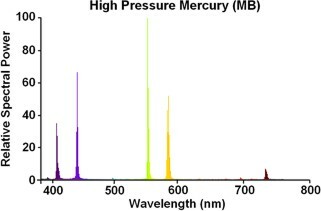 It is not a phosphor and provides no colour correction to the light produced by the arc tube. Owing to the reduced thickness of the coating it only has a minimal diffusing effect, and thus a narrow spot beam of light is produced. Because the arc tube is so small, it is enclosed in a vacuum atmosphere to accelerate run-up. Heat reflectors of platinum paint are applied behind the electrodes, again to conserve heat and shorten the otherwise very long warm-up. The marking on the lamp is applied to the inside surface, as per the standard method used on lamps for the Japanese market. 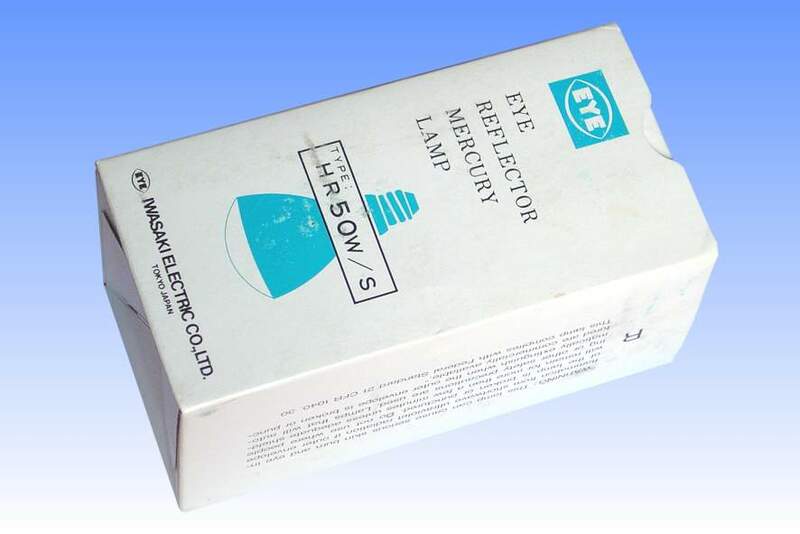 This ensures that the durability of the marking is unimpaired, it cannot be accidentally wiped off the glass, which frequently occurs on outside-marked lamps. References: 1) Iwasaki Japan Lamp Catalogue 1999.